The United Kingdom Trade and Investment (UKTI)’s most recent – and biggest – trade mission to Iraq saw Coventry University take the stage in sharing its computer simulation expertise. The trade mission is part of a series of events designed to expand and grow the UK’s trade with the oil-rich nation. The University was in good company, with 52 senior business executives and British higher education institutes. They were joined by more than 100 of their Iraqi counterparts. Coventry has a well recognised strength in applying computer simulation to solve complex industry problems. The University’s research projects have used this technology to enable new global safety systems for helicopters, efficient energy monitoring and improved emission predictions for engine after-treatment systems. 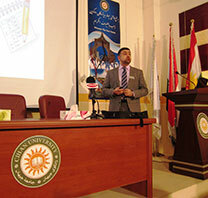 Coventry’s Dr Ammar Al Bazi visited a number of state and private universities in Erbil, delivering guest lectures to a large audience from both academia and industry. Two of the universities visited – Salahaddin and Cihan universities – are based in a rapidly developing part of the country, where computer simulation is recognised as being vital to improving business prospects. Dr Al Bazi introduced one of the business improvement technologies being taught at Coventry University and widely used in a number of applied research projects here in the UK. He also discussed a number of research opportunities with both universities.